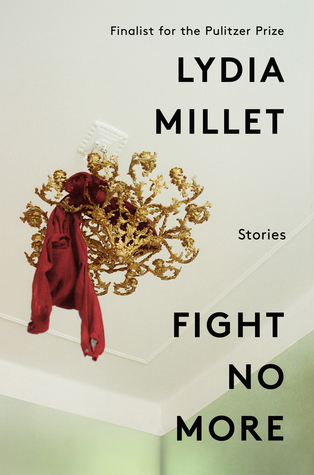 This month the New and Noteworthy book club read Fight No More by Lydia Millet. I didn’t expect it to be a tough book to write a blog post about, but it’s the day of the book club and I’ve been at a blank for two weeks. Part of the reason is that the content of Fight No More, a collection of short stories connected by characters and place, hinges on the particular grief of unexpected death. And, then, of course, there’s the short story, about a third of the way through, which changes everything. “The men’ll take care of it, she’d say to herself, if she had a lot on her to-do list, and sooner or later the men would file in. Their blunt-fingered hands were capable of surprising dexterity. The rest of the book has no magical realism at all, save for references to Delia’s homunculi. They exist in their own incredible slice of the regular world. Are they hallucinations? Possibly–Delia has enough emotional trauma in her recent past to justify them. But I’m not convinced that The Men can be dismissed so easily. Delia lives alone in the house, except for The Men, of which there are seven. Their role grows as she deals with the absence of her husband, who recently left her for a younger woman; they fold her laundry, order her groceries, and cook her dinner. As their influence increases, so does their stature, until they’re larger than life, and she is forced to leave and sell her home out of fear for her own safety. At work, she catches sight of a cruel office email, placing her in the role of Snow White, waiting for a Prince Charming who has already left with his secretary. Lydia Millet is a master. I don’t believe the men are a delusion, although they may be a coping mechanism. I believe that in this world of Millet’s creation, the unexpected, the impossible, might be happening under the characters’ very noses. I love this splash of fairy magic, a secret ingredient setting this book apart. Come talk to me and Jan about it TONIGHT at BookPeople at 7PM! We’ll be on the third floor, to contain all of my feelings (as always). I can’t wait to see you there.